Repeat the whole procedure at least once a week and you’ll be a different person. Chop wood, heat the banya, be a man and take a birch broom hit. 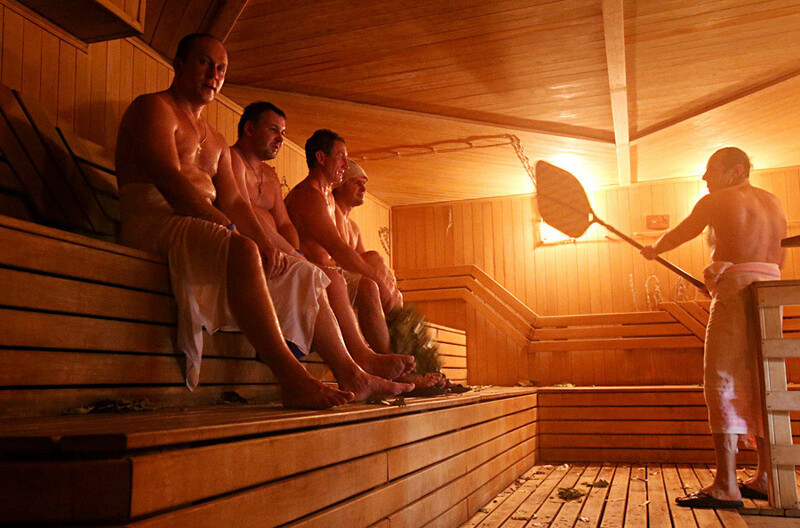 We have everything you need to know when enjoying the legendary banya. Banya is not only about recreation; it’s also about socializing in a relaxed way. Invite only close friends with whom you are comfortable sitting in silence. Avoid friends who you’ve not seen for a while, and those who have news to pour out on you (got married, had kids, bought a dog, whatever). Banya is not about listening to other’s lives. The bottom line is three or four close associates who haven’t ever been noticed to suffer from verbal diarrhea. Though often violated, this is an uncontested banya rule: Eat prior to banya, abstain thereafter. One must not feel hungry in the banya, but feeling stuffed is also a no-no. Fix a low-calorie salad an hour before. Also, abstain from a heavy dinner after banya. Tea and a few caviar-stuffed blini could also do. We take it that you already have a bundle of firewood neatly stocked at the banya entrance. The most authentic way is to chop the wood with your own hands. Few people, however, do so these days. Thus, buying firewood is an acceptable, though much less satisfying, alternative. Prior to your one-hour-before bite, fill the oven with wood, and ignite. You should heat the banya to 70-80 degrees Celsius. The exact temperature inside the banya is a highly debated issue among experienced banya-goers, and preferences vary from 65 C to 120 C.
Essentially, it all depends on how well you take the heat. Just remember that you are not seeking to impress anyone with your endurance to extreme climate conditions, but rather to relax and enjoy the whole thing. There are many types of wood; if you don’t have a strong preference for what type of tree to chop down, then stick to birch – it’s a timeless classic. The most authentic way is to chop the wood with your own hands. Few people, however, do so these days. As you fill the banya stove with wood, pour warm water in a trough, put your banya broom in and let it soak for a while. You want the leaves to be wet and soggy, and all the small branches sodden – only then will the broom be suited for massage. Just as there are plenty of types of wood, there are many types of brooms. Best to stick with birch – a timeless classic. This rule is probably the most violated, and we doubt there’s a living person who has adhered to it over the years. Drinking in banya is the ultimate evil. Yet, since so many people do it, don’t fret too much about the matter. Ultimately, it’s up to you: Stick to herbal tea if you want the purest banya experience, but you won’t be frowned upon if you crack open a bottle or can during or after banya. But by all means, forget soft drinks and cold water. They’re a huge No! When the banya is heated to the right temperature and the broom is soggy enough, it’s time to take your first round. Take a shower without soap or any other cleaner. This is extremely important because the soap clogs the pores and diminishes banya’s healing effect. Do not wet your hair while taking a shower; wet hair can’t protect your head from overheating. As you have taken a shower, you are finally ready to get some steam. Step in and lay down on the lowest bench (there are usually 2 or 3 levels), and remain lying for about 5-10 minutes. After this time is over, get out and spend some time in an adjoining room. Do not pour cold water over yourself just yet – leave it for the right time. When you feel you are ready for the second round, go in again (now accompanied by a fellow bather); only this time lie down one level higher, and take it a little longer than 10 minutes. Let your friend pour some water over the stove (or stones), and wave the neatly sodden broom from the stove/stones and towards you, so as to disperse steam all across the room. To fortify the healing effect, exit the banya and douse yourself with an ice bucket. When the room is steamy, wet and hot, it’s time for a healing broom hit. The one in charge of the broom should begin with gentle stroking and slight patting, moving constantly up and down along the body, from neck to feet and then back again. You want to apply not only the broom itself, but also the hot air that it circulates, and thus disperses around the body of whoever is receiving the massage. Advanced bath attendants may use two brooms simultaneously. Enjoy the massage for 5 to 10 minutes, then change and work on your friend for a while. To fortify the healing effect, exit the banya and douse yourself with an ice bucket. Ooh! Feel the energy? That’s right! Finally, it’s time for a break. Enter the banya one last time; only now sit (do not lie) on the lowest level and stay there for few minutes – enough to warm your body after the ice bucket, but not so long as to start perspiring again. When you warm up, leave the banya and take a shower (this time with soap). Clean yourself thoroughly and dress. There is no need to write it here – your eyes will start closing as soon as you leave the banya. Go straight home and straight to bed and sleep like a baby. You are welcome. Ideally, repeat the whole procedure at least once a week and you’ll be a different person. One day, you might even become a fearless Russian if you go through it enough times. Fancy some Russian steam but don’t know where to start? Here we list Moscow and St. Petersburg’s best banyas, enjoy. S legkim parom!